After establishing it’s name in Phnom Penh with three amazing hotels, the Frangipani group arrived in Siem Reap in 2010 to open the Frangipani Villa Hotel on Wat Bo Road, a 10 min walk from the crowded Pub Street. The hotel offers a clean and chic design in a classic and warm style. It offers all the luxury amenities and services to make your stay as comfortable as possible. 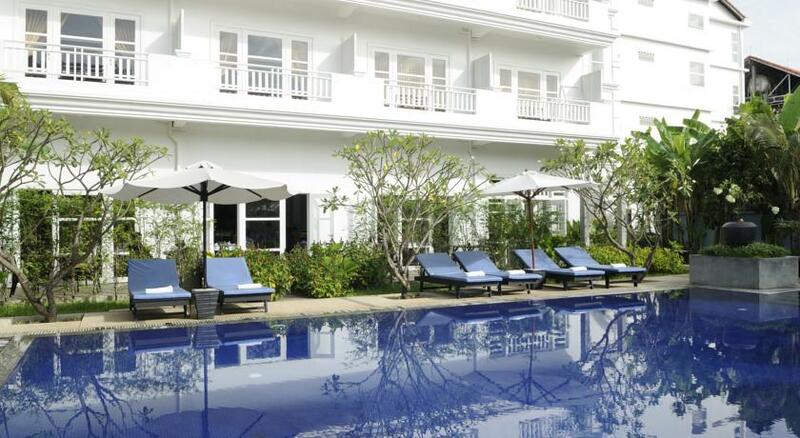 At the back of the hotel, you’ll find a shady garden and refreshing swimming pool. Here you can relax and enjoy a drink or meal from the hotel’s splendid kitchen, offering both local and international cuisine and on top of that a wide range of drinks such as coffee, wine and cocktails. Keep in touch with home or the office, using the free wireless internet which is accessible all over the hotel. Make your travel arrangements and tour bookings without leaving the hotel. Frangipani Hotel’s helpful staff will be happy to assist you and make your stay unforgettable!